It is widely agreed by historians that Juan Cabrillo discovered San Diego Bay in 1542. Markey disagreed. According to him Francisco de Ulloa sailed to “upper California” in 1540. If Markey is right, this would mean that he beat Cabrillo by two years. Myth or reality? Markey swore he had proof. 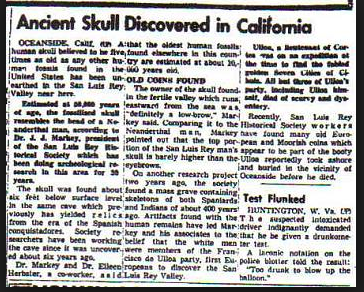 The first noteworthy information in Dr. Joesph Markey’s research is the location of Ulloa’s grave. Markey claimed he had found the final resting place of the mysterious captain. Remember, back in 1964, I myself went to Oceanside to look for this grave, based on the T.V. Show “Treasure”. The documentary claimed to know the alleged location of Francisco De Ulloa’s grave and I was able to locate it based on the show’s direct clues. However, sifting through all the recent documents that I obtained on Markey’s claims: newspaper articles, Markey’s own written statements and pictures, something was amiss. The grave was now in a different place according to this new information. It was no longer where I had found it so many years ago. This threw a lot of doubt in my mind on the credibility of Markey. But, nevertheless, I continued chasing the information. The directions in the new information took me in a completely different location. I got extremely close to where the exact grave was, but still could not pinpoint it. Surprisingly, through the Oceanside Historical Society, I met a lady who grew up in Oceanside and remembered that as a child she would play by the grave site. She agreed to take me to the exact site. She had not been to it in years, but said she could locate it for me. The kicker: we actually went to where I thought it was! She was the final key. Could she actually relocate the grave after all these years? Indeed she did and it was nowhere in the same vicinity of where I went in 1964. The let down however, was that there was a house sitting on it. While we ended up in the exact place that Markey claimed it was located the mystery was still unsolved.